Simon & Schuster, 9781439170878, 272pp. From PEN/Hemingway award winner Brando Skyhorse comes this stunning, heartfelt memoir in the vein of The Glass Castle or The Tender Bar, the true story of a boy’s turbulent childhood growing up with five stepfathers and the mother who was determined to give her son everything but the truth. When he was three years old, Brando Kelly Ulloa was abandoned by his Mexican father. His mother, Maria, dreaming of a more exciting life, saw no reason for her son to live his life as a Mexican just because he started out as one. The life of “Brando Skyhorse,” the American Indian son of an incarcerated political activist, was about to begin. Through a series of letters to Paul Skyhorse Johnson, a stranger in prison for armed robbery, Maria reinvents herself and her young son as American Indians in the colorful Mexican-American neighborhood of Echo Park, California. There Brando and his mother live with his acerbic grandmother and a rotating cast of surrogate fathers. It will be over thirty years before Brando begins to untangle the truth of his own past, when a surprise discovery online leads him to his biological father at last. From an acclaimed, prize-winning novelist celebrated for his “indelible storytelling” (O, The Oprah Magazine), this extraordinary literary memoir captures a son’s single-minded search for a father wherever he can find one, and is destined to become a classic. “This isn’t a predictable tale of irresponsible parenting. Skyhorse’s mother jiggers his history faster than he can learn it. What’s a ­Mexican-American boy, living in Los Angeles, to do when his mama reinvents herself as Running Deer Skyhorse and declares that his biological father is an incarcerated Native American political activist?... Slowly, surely, his story reveals a ­larger message: the cost of transforming life into art." "[A] heart-wrenching tale packed with humor, love, and compassion. This memoir manages a rare feat: telling a riveting true story of a grown man’s past, while making the reader feel protective of the boy at the heart of the telling. Much like Skyhorse’s young life, 'at least it’s never boring.'" "A writer on the rise.... this [is a] gripping memoir." "[A] stunning memoir of emotional dysfunction and hard-won understanding.... Skyhorse has a keen ear for language and for story but his capacity to understand and forgive, to find the humanity in the difficult people around him, should elevate his work to a literary classic." "A harrowing, compulsively readable story of one man’s remarkable search for identity." "A wickedly compelling account of a dysfunctional childhood. By turns funny and wrenching, the narrative is an unforgettable tour de force of memory, love and imagination." "A beautiful, compassionate, but also hilarious and hair-raising tale of one boy’s life, the lies and truths his mother told, and the damage and the magic she created. Brando Skyhorse is an irresistible writer with an incredible story." "Take This Man is as astonishing a memoir as I've ever read. Brando Skyhorse's beautifully-told tale of his truly bizarre childhood and his search for a father moved me in a way that few books have. I will never forget Skyhorse's charismatic mother and grandmother, nor the tortured triangle the three of them formed. I was reminded at times of Geoffrey Wolff's The Duke of Deception, and also of The Glass Castle by Jeanette Walls and The Tender Bar by J.R. Moehringer. But I guarantee that this is a family story unlike any you've read before. It deserves to become a classic." "Take This Man reaches beyond the bounds of my imagination. We use the word “survivor” with disgracefully casual ease. But this writer truly survived being held hostage, raised by wolves. Brando’s grandmother and mother are terrifying and mesmerizing. Their cruelty to their biographer was audacious, calculated and thrilling to read. Stories molested him and nourished him. And it is with relief that I read in Take This Man flashes of Brando’s bitterness and heat, sane fury directed at the Scheherazades who toyed with him. Whatever else they did to him, when he escaped he knew how to tell a story, and this is one hell of story." 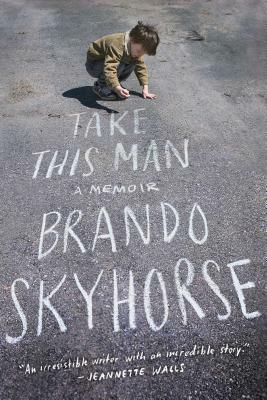 "The details of Brando Skyhorse’s life are as outlandish and attention-grabbing as his name. Imagine the kind of mother who advertises you for adoption in the back of a magazine and then denies it to your face, or the kind of stepfather who calls his prison ‘Arizona State,’ as if discussing his alma mater. Take This Man is a funny and harrowing and touching portrait of the abyss in families between what we know we should do and how our hearts lead us to behave." "Brando Skyhorse’s unputdownable Take This Man is one of the most moving and mesmerizing memoirs I’ve ever read. I’m still reeling. Its familial dysfunction rivals The Glass Castle, the poetry of the language echoes This Boy’s Life, and the bravery in Skyhorse’s search for answers, for a family, conjures up Wild. Yet Skyhorse’s memoir is wholly and uniquely his own. As his mother’s mantra went: ‘At least it’s never boring.’ And it never is. This is a miraculous memoir from a spectacularly talented writer." "This gorgeous, wrenching, ultimately uplifting book is a testament to the large and generous heart of its author. Brando Skyhorse has made art out of the chaos of his own extraordinary family history, and, in so doing, has raised the bar, not only for memoirists, but for us all." "Take This Man is a grand story full of fantastic characters--characters whom the author brings vividly to life because they ARE his life. Skyhorses's shifting identity creates an intense quest for meaning, a kind of whodunit memoir that explores the sometimes hilarious, sometimes heartbreaking, often absurd, and always fascinating childhood that the author, no matter his lineage, has no choice but to claim as his own. Pour a shot of Wolff's This Boy’s Life, add a jigger of Moehringer's The Tender Bar, throw in a splash of Rivera's Family Installments, and this is what you get: a heady cocktail of memories with a twist."